The ongoing shift to cloud computing continues to favor the hyperscale public cloud service providers. That said, there is also a trend to build new local data centers in more countries, where data sovereignty laws require secure storage of data with the nation's border. The worldwide cloud infrastructure services market grew 49 percent annually, reaching $10.3 billion within Q4 2016, according to the latest market study by Canalys. 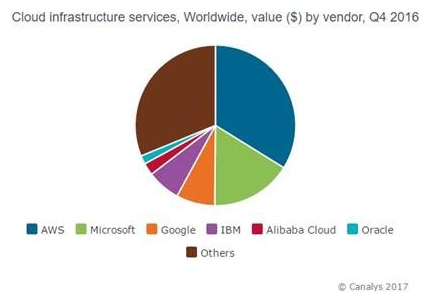 AWS continued to dominate with a 33.8 percent global market share, while its three nearest competitors – Microsoft, Google and IBM - together accounted for 30.8 percent of the market. The four leading service providers were followed by Alibaba and Oracle, which made up 2.4 percent and 1.7 percent of the total. Canalys forecast the market will reach $55.8 billion in 2017, representing a 46 percent growth from the total value of $38.1 billion in 2016. Continuing demand is driving the adoption of cloud infrastructure services, which accelerated the cloud data center expansion among key service providers in Q4 2016. AWS launched 11 new availability zones globally in 2016, four of which were established in Canada and the UK in this quarter. IBM also opened its new data center in the UK, bringing its total cloud data centers to 50 worldwide. Microsoft strengthened its cloud capacity in Western Europe, with new facilities in the UK and Germany. Google and Oracle set up their first infrastructure in Japan and China respectively, aiming at expanding their footprint in the Asia Pacific region. Alibaba also unveiled the availability of its four new data centers in Australia, Japan, Germany and the United Arab Emirates, highlighting its ambition to drive the presence outside of China. "Strict data sovereignty laws and customer demand are pushing cloud service providers to build data centers in key markets, such as Germany, Canada, Japan, the UK, China and the Middle East; where personal data is increasingly required to be stored in facilities that are physically located within the country," said Daniel Liu, research analyst at Canalys. Expanding data center locations across the world and into key economies has been critical in supporting multi-national customers in their digital transformation initiatives. These services are also providing digital platforms for businesses to access new markets and capitalize on new trade opportunities, such as Alibaba’s Tmall Global.